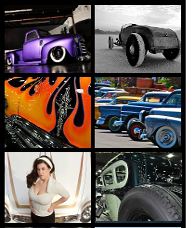 Is SEMA known for Hot Rods? 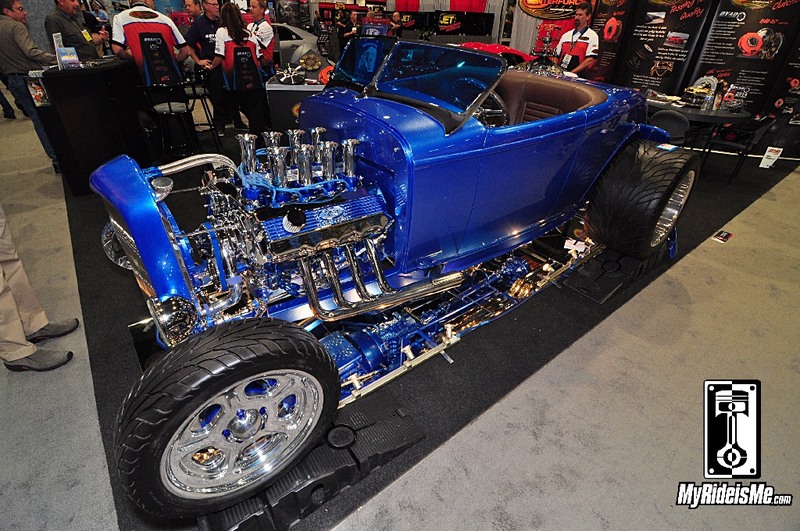 I have to say late model cars (unfortunately) dominate at the SEMA Show. There are times when I felt like I was tripping over the new Camaro, Mustang and of course, the Scion FR-S. Those are the “modern day hot rods” I guess, so it could be worse. But could it be any better than this? The beast you’re staring at is an original, “Sock” motor. If you heard that and said, “WHAT? ?” Then let me clue you in. Sock refers to SOHC or single over head cam. You’ll also hear it called a “Cammer” motor refering again to the overhead cam design. Ford, in the glory days of racing, back in 1964, set forth on the world one of it’s most glorious creations. Why? (besides why not!) They were merely trying to compete with the Chrysler 426 HEMI at the track. What’s the harm in that? It’s a TRUE thing of beauty to see, only overshadowed by the sound. 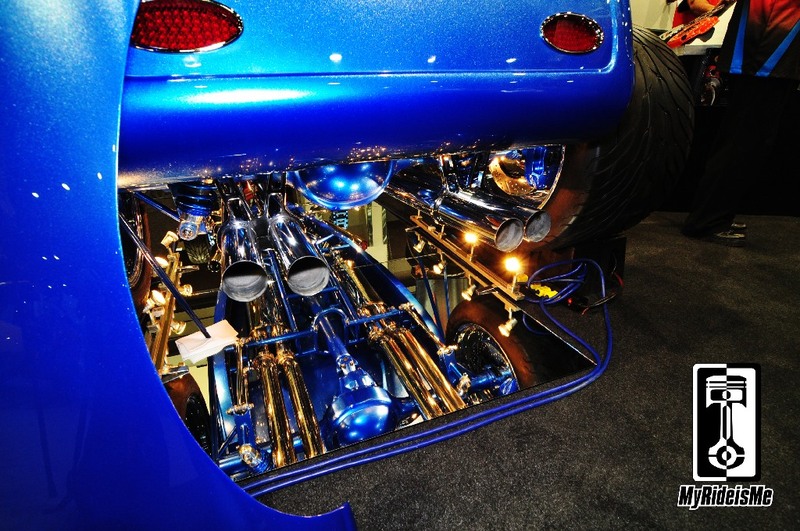 When you hear one, you’ll know and I’m working with Centerforce Clutch to get a video of this bad boy on the dyno! 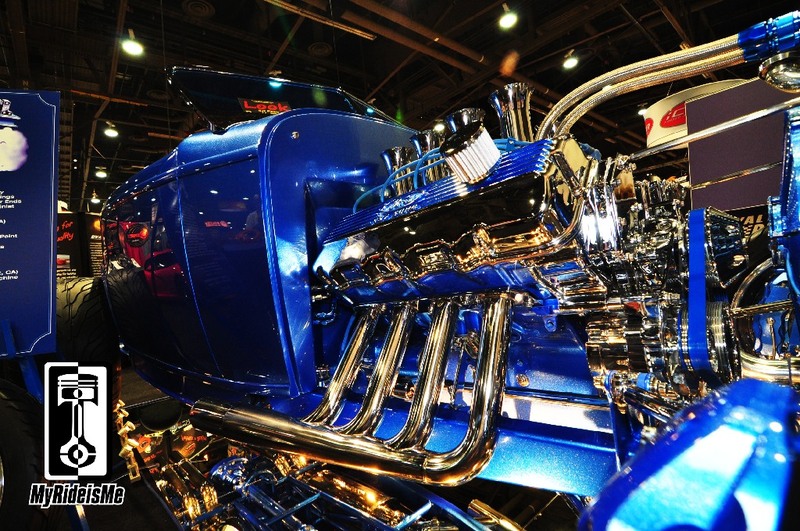 I heard and estimated 650-700 horsepower! In case you hadn’t guessed… I was pretty impressed with the powertrain… but, overall, this is a great looking car! As one of the very first hot rods I saw on the show floor, I couldn’t help stopping to take pictures. 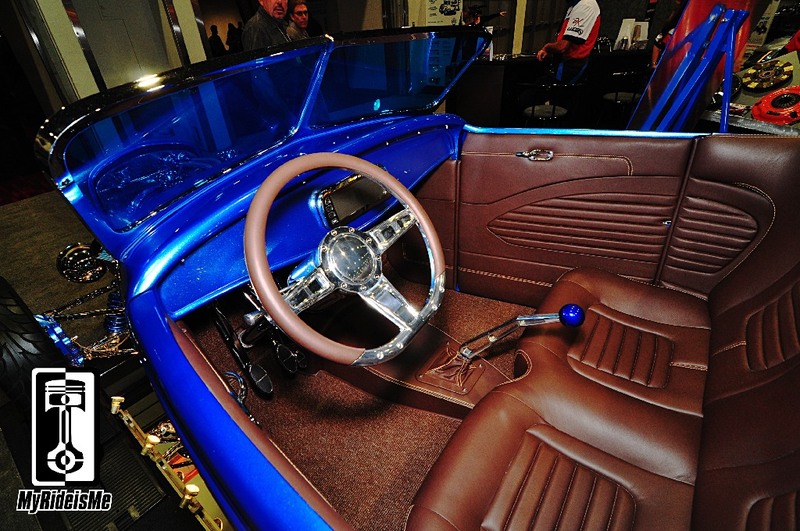 The paint, the interior… GREAT hot rod stance. 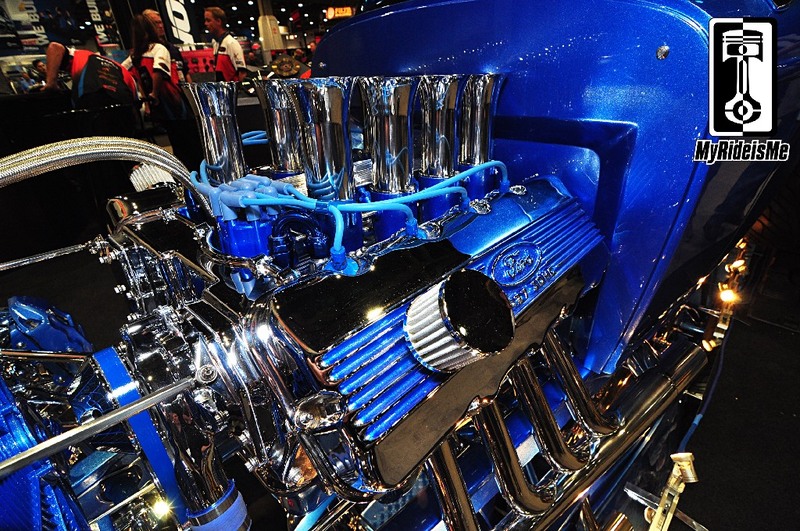 It’s a winner in every way with custom details and finishing touches everywhere. I don’t think it’d take much for this car to be a contender for America’s Most Beautiful Roadster. 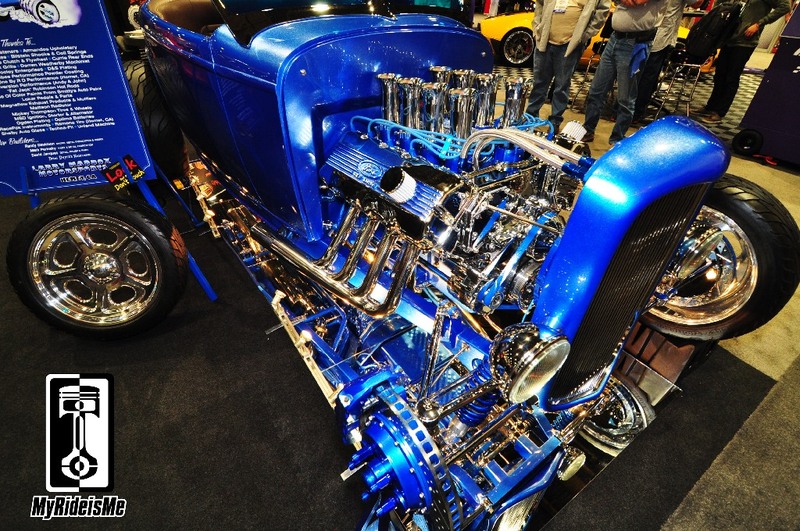 Enjoy the pictures and let me know what you think… was this one of your favorite hot rods? 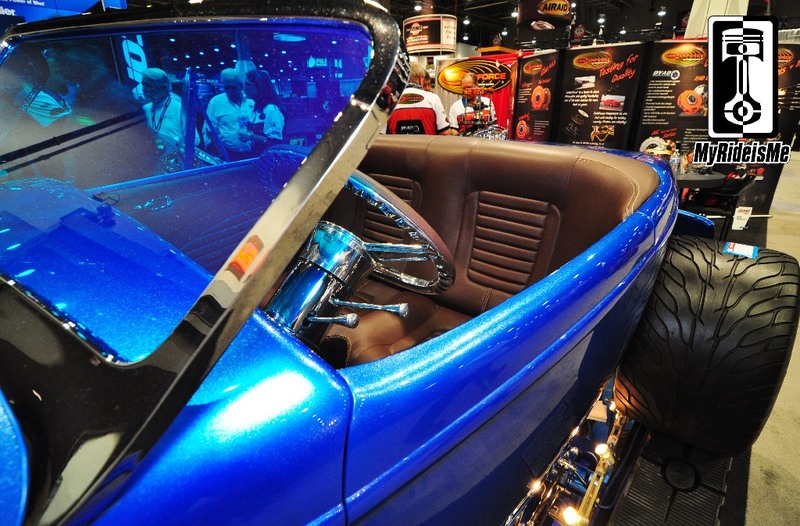 Thanks for the coverage and comments on “Blue Steel” the roadster. The Car would not have happened if it were not for Larry Maddox. I have had the car for 9 years before partnering up with Larry. Fat Jack Robinson contributed much to getting the car started. And several manufactures were indispensable, M\T tires, Magnaflow Exhaust, Baer Brakes, ARP, and MSD, not to mention Centerforce and Bilstien. Of course you can’t build one of these without having to rely on Lokar. The car had not yet run before SEMA, but in the next week or so we’ll fill it up with Royal Purple lubricants and get it on the Dyno at Westech. The car will be a contender for the AMBR Trophy in January. Everyone at M/T is proud that our products were chosen to be part of Blue Steel’s awesome look and stance! We cant wait for pictures and video of this thing smokin those HUGE Mickey’s!